When in search of a modern style of legs for sofas or beds, turn your attention to the aluminium sofa and bed legs from Peter Ross Enterprises. 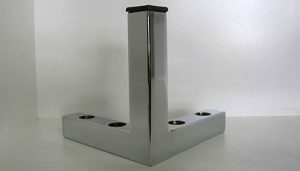 Legs out of this metal not only are attractive with their sleek design, but also they are rustproof and highly durable. We offer a variety of styles to ensure that you will discover the right one for your needs. Read further details about the benefits of these legs here in our information. Our legs with their sharp corners and sleek lines adhere to the modern design principles that are so popular today in furniture. Add these features to the shininess of aluminium and you have a win-win choice with legs for beds or sofas. No matter the height or style that you select, you will delight in how well these legs fit with modern furniture. Even in damp weather conditions, aluminium will not rust. The scientific reason for this is the fact that this metal forms a layer of aluminium oxide naturally that is impermeable. This layer is what provides this metal with its high level of rust resistance. When you purchase aluminium sofa and bed legs from Peter Ross Enterprises, you support a local industry. We manufacture these legs and our other choices right here in Australia. With each purchase, you receive a guarantee of quality and satisfaction. Please, browse through our entire selection of legs to discover all that we have to offer. © Copyright 2017. All rights reserved by | » Aluminium Sofa and Bed Legs for Rust Free Unique Design Peter Ross Enterprises Melbourne | Website Designed by: Netwizard Design.